Today we continue with the knot conformations collection that we started on Day 266. (See also Day 267, Day 268, Day 269, Day 272, Day 273, Day 275, and Day 276.) Today's knot is 6_3. Along with the usual conformation of 6_3 we printed a confirmation with a Seifert surface. A Seifert surface is a surface whose boundary is the knot, so if you trace along the edge of the red model you will trace out a conformation of the knot 6_3. Settings: Printed on a Replicator 2 with the model on its side, to minimize supports. 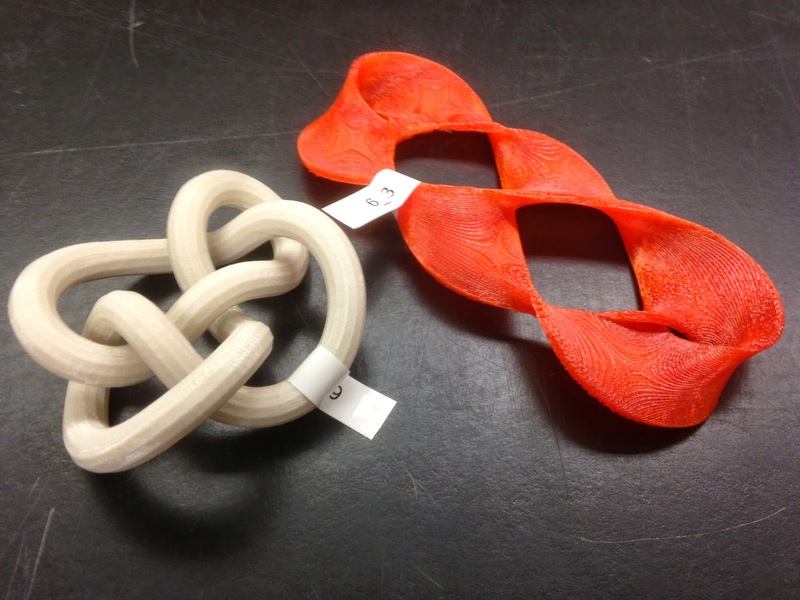 Technical notes, math flavor: This knot was made by Jonathan Gerhard, who has this to say about the math behind his model: A Seifert surface of a knot is an orientable, simply connected surface with a knot as its boundary. There are infinitely many different Seifert surfaces for any given knot. This particular example is a “Ribbon” configuration of a surface with the 6_3 knot as its boundary. An algorithm to create such a surface from any knot was first given by Herbert Seifert in 1934, and since then many different knot invariants, things that don’t change no matter how the knot is represented, have been found in relation to these surfaces. To begin with, you need to download a special version of SeifertView that allows exporting. It’s not currently online, so if you need it, contact me at gerha2jm@dukes.jmu.edu. On the right-hand side of the SeifertView window there is a menu in which you can click on 6_3. Then on the bottom there will be an option to change it into a Ribbon surface and an option to Smooth the surface. Unclick the Smooth button after you’re satisfied with the smoothness. Now you'll want to go to Misc. in the upper right-hand corner, choose Advanced, and choose Save Geometry under option two. Now go in Blender, go to File/Import/OBJ. On the right-hand side there will be a small row of icons including a camera, sphere, etc. Choose the wrench, click Add Modifier, and then choose Solidify. Finally, hit Apply, then go to File/Export/STL.